Is Oatmeal a Gluten Free Choice? Home » Food and Nutrition » Is Oatmeal Gluten Free? Oats and oatmeal are part of a standard healthy breakfast for many Americans. What’s not to like, right? It’s full of nutrients. It’s a nice hardy grain to start your day. And it’s loaded with health benefits. However, a lot of people ask me, “Is oatmeal gluten free?” or “Is there gluten in oatmeal?” The answer is yes… and no. Does oatmeal have gluten? Oats and oatmeal are not wheat products, and therefore they are naturally free from gluten. That said, they often become contaminated with gluten from other grains when processed in a factory. So, should oats and oatmeal be added to your list of gluten free foods? Should oats and oatmeal be added to your list of gluten free foods? It seems like everyone today is trying out a gluten free diet. In fact, as much as 30% of Americans try to avoid gluten for some reason. Some people don’t even know what gluten is, let alone why they’re avoiding it. Gluten is a family of proteins called prolamins found in grains, including wheat, whole grain, rye, barley, kamut, spelt, and other grains. The specific prolamins in gluten include gliadin and glutenin. These proteins are what give pasta and bread their chewy and stretchy textures. Unfortunately, gluten can be a real problem for some people. Its unique amino-acid structure can make it harder for digestive enzymes in the gut to break down the protein. People with celiac disease are sensitive to gliadin. This autoimmune condition produces symptoms such as greasy stools, weight loss, and many nutrient deficiencies. There is also a condition called non-celiac gluten sensitivity, which will also cause similar symptoms. The difference is that people with celiac disease must avoid all foods, supplements, medications, or substances with gluten; people with a gluten sensitivity may tolerate various amounts of gluten, and that depends on the individual’s overall intestinal health. People should also avoid gluten when they have a wheat allergy, which can be an immediate and possibly life-threatening response to wheat. On the other hand, food sensitivities or food intolerances will produce some bothersome symptoms such as mood swings, bloating, abdominal cramps, headaches, recurring infections, joint pain, skin rashes, fatigue, and dark circles under the eyes. Gluten and wheat are among the top food sensitivities. Oatmeal: Is it Gluten Free? Is oatmeal good for you? Oats and oatmeal are safe for most people who are intolerant to gluten. Other gluten free foods include brown rice, quinoa, wild rice, millet, teff, amaranth, and buckwheat. As mentioned, oats can be contaminated with gluten; however, when there is no contamination, oats have been proven to be safe for those intolerant to gluten. Studies have also found that wheat allergy or celiac disease sufferers can tolerate 50 to 100 grams of pure, uncontaminated oats daily without harmful effects. In an eight-year study published in the journal Nutrients in 2015 (1), researchers found that over half of 106 celiac disease patients ate oats every day, and none experienced any negative side effects. Another study published in the Scandinavian Journal of Gastroenterology in 2008 (2) found that patients fed a gluten free diet with oats would not show elevated immunoglobulin A (IgA) levels when compared to those who did not consume oats in the same diet. IgA is an antibody that is high when those intolerant to gluten eat wheat. What if Oats Are Contaminated with Gluten? What is the issue with oats being contaminated with gluten? It starts with how the oats are grown. They often grow alongside other crops that contain gluten, and if the same equipment that harvests gluten-containing crops also harvests the oats, then cross-contamination occurs. Products with oats are often processed in facilities that contain gluten products, which can also lead to cross-contamination. So, it’s not a surprise that many oat products contain gluten above the standard for gluten free foods. A study published in the European Journal of Gastroenterology & Hepatology in 2008 (3) examined 109 products with oats from Europe, Canada, and the U.S. Researchers found that the products had an average of more than 200 parts per million (ppm) of gluten—just 20 ppm of gluten can cause a reaction in celiac disease patients. The high risk of gluten contamination means that it’s generally not safe for gluten free diet plans to include processed and conventionally grown oats. That’s why many companies grow oats away from gluten-containing crops and process oats using equipment that doesn’t touch anything with gluten. Certified gluten free labeled oats must contain less than 20 ppm of gluten before they can be marketed as gluten free. Are Gluten Free Oats a Problem for Some People? However, even without the contamination issues, some people with celiac disease and other issues may still have a problem with pure oats. This is due to a protein called avenin, which has a similar amino acid profile as gluten. 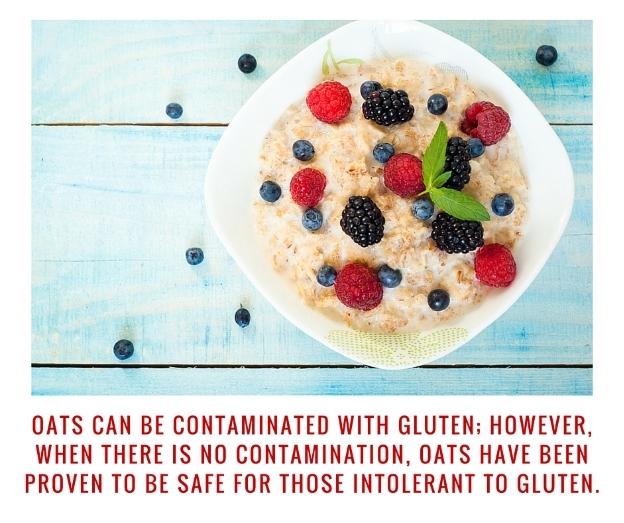 Most people sensitive to gluten will not have a problem with avenin, and therefore uncontaminated oats should be on the menu. A study published in the Journal of Autoimmunity in 2015 (4) found that only 8% of celiac patients with the potential to react to avenin actually reacted after consuming a large amount of oats. These are also called Irish oatmeal or Scottish oats. They are unflattened kernels used for stuffing or breakfast cereal. The oats are thinly sliced with steel blades. As a result they have a chewy and dense texture. These are groats that are steamed, rolled, and flattened. Oat bran is the outer layer of the kernel under the hull of the oat. Like steel cut oats, oat bran retains most of the bran part of the grain. Instant oatmeal contains oats that are partially cooked and rolled very thin. It should be noted that instant oatmeal has a higher glycemic index than other oats, and therefore it may lead to an increase in blood sugar. These are processed like old-fashioned oats, but they are finely cut before they are rolled. Rolled oats are any oats that are rolled during processing, including old-fashioned oats and quick-cooking oats. Oat flour is a product used for baking. Although it’s often combined with wheat or other gluten grains, it can also be combined with non-gluten flours such as quinoa or buckwheat. Oats are very healthy, and are a great addition to gluten free diets. They are a good source of many nutrients, including fiber, manganese, selenium, phosphorus, magnesium, vitamin B1, and protein. 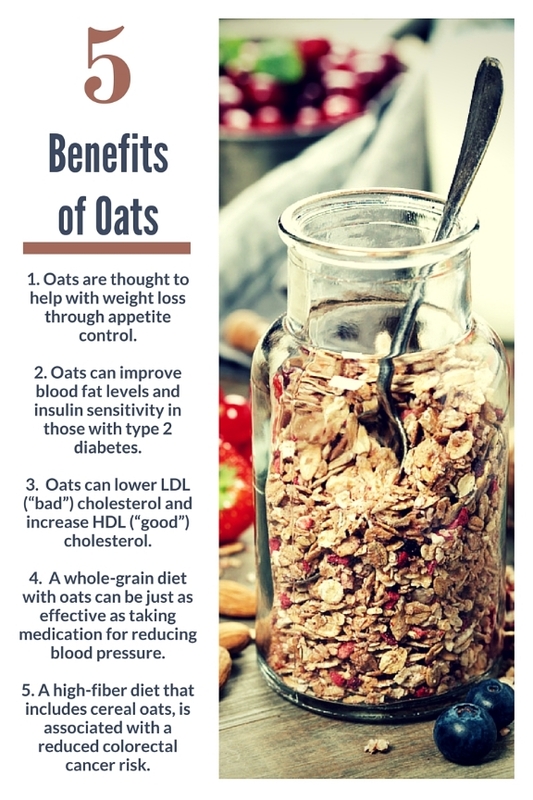 Here are some of the health benefits of oats. Is oatmeal good for weight loss? Oats are thought to help with weight loss through appetite control and increasing fullness, according to a study published in the Journal of the American College of Nutrition in 2013 (5). These effects are linked to the hydration and viscosity properties of a specific fiber in oats called beta-glucan. Studies have also shown that beta-glucan and oats can benefit diabetics. A study published in the journal Nutrients in 2015 (6) revealed the beneficial effect of oats on lipid profiles and blood sugar control in type 2 diabetics. Oats can also improve blood fat levels and insulin sensitivity in those with type 2 diabetes. 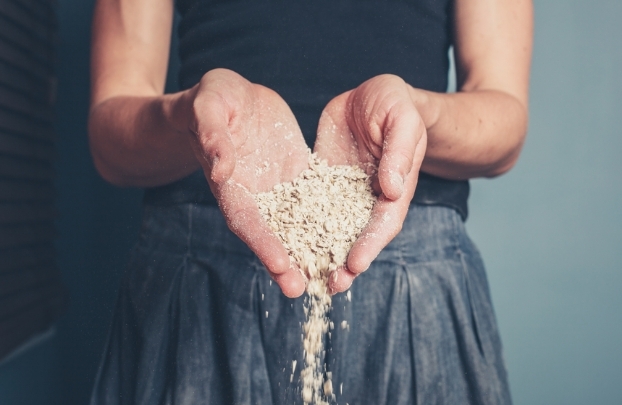 In countless studies, the beta-glucan in oats or oatmeal has been shown to lower cholesterol. In particular, oats can lower LDL (“bad”) cholesterol and increase HDL (“good”) cholesterol. The cardio-protective effects of oats may also be due to unique phenolic phytonutrients called avenanthramides. Studies have also found that a whole-grain diet with oats can be just as effective as taking medication for reducing blood pressure. In a study published in the journal BMJ in 2011 (7), researchers from the Netherlands and Britain found that a high-fiber diet, which included cereal oats, is associated with a reduced colorectal cancer risk. The research team found that every additional 10 grams of fiber in the diet reduced the risk of colorectal cancer by 10%. Look for the certified gluten free label. Avoid bulk bins, as there is no way for retailers to completely eliminate cross-contamination. It could be someone using the same scoop for oatmeal and wheat flour, or an employee failing to change gloves when restocking bins. Avoid ordering oatmeal from restaurants if going gluten free. You can never be certain if the oats are free of contaminants. Want a cookie recipe you can feel safe about? Try this chewy cookie recipe, which contains gluten free rolled oats. It’s a sweet treat that will leave you feeling satisfied. Preheat oven to 350 degrees Fahrenheit, and grease a cookie sheet. In a small pot, melt cashew butter and coconut oil over low heat, and set aside. In a large bowl, mix sesame seeds, coconut, rolled oats, and hazelnut flour. In another bowl, whisk sugar and eggs. Add melted oil mixture and mix well. Add the wet ingredients to the dry ingredients, and stir until it’s all mixed well. Form one-inch balls and arrange about two inches apart on the cookie sheet, and flatten with a fork. Bake for 10 to 12 minutes, or until golden brown. Transfer for cooling, then enjoy! Should Oats/Oatmeal Be in a Gluten Free Diet? Do oats have gluten, and is oatmeal gluten free? Hopefully it’s now clear that oats are naturally free from gluten, although they are at risk of being contaminated with gluten grains such as wheat. There are several benefits to including oats in a gluten free diet. Just make sure you look for oat products that are labeled as certified gluten free, to ensure that they are uncontaminated; it’s fairly easy to find such products in your local grocery store or online. Eating oats is an individual decision, especially since people may also react to avenin. It’s a good idea to visit your doctor, a dietician, an allergist, a naturopath, or a holistic nutritionist to help test your sensitivity to oats and see whether you can tolerate them. For those who can, enjoy your oats!